Rewards: Skeleton suit set, access to 12 more hours double XP. Stoked for the event but, when are we back up? Drop some masks please. Or a lot. The tag [Server Down for Update] will be removed from the title as soon as the server is back up! The 'update' message will continue to show until then. How do you download the updated server? If your Android APK is not updating, please uninstall the application and re-download it from our website. Please give link to new client download for new server as the one on the home page doesnt work says it needs update! try asking about that on discord. its supposedly better for getting help. If I've tried everything I've been told multiple times and it still doesnt work ?? opeser. when i first tried playing this game it would no work for me no matter who and what diff things i tried. eventually i had to get NOM the game designer/owner etc to use remote access to my pc to get it to run. it's a 10 year old laptop that runs xp. have some patience. it took me about 2 weeks for my work schedule and NOM's to mesh so we could both be online together. 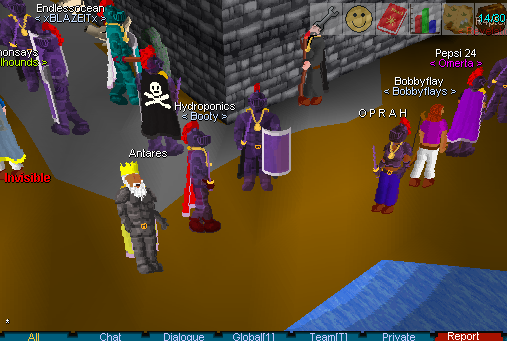 If you like the old runescape then trust me wait and you will get it solved. there is a pretty active player base here. I have the same problem. Keep saying I need to update... Uninstalled and deleted everything, still No luck..